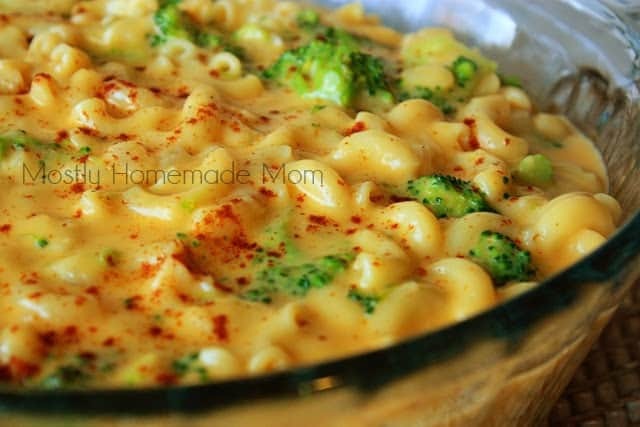 You are here: Home / By Meat / Meatless / Broccoli Cheddar Mac & Cheese with Smart Balance! 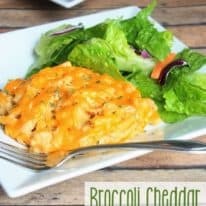 Broccoli Cheddar Mac & Cheese with Smart Balance! This unique meat-free dish combines the flavors of traditional macaroni & cheese with broccoli cheddar soup with heart healthy Smart Balance butter! One of my favorite restaurants in college served this amazing broccoli cheddar soup with yummy homemade crusty bread. In recent years, I’ve been in LOVE with soups of all kinds and pretty much all I’ve tried have turned out amazing. That is, all except my favorite broccoli cheddar. I’m not sure what it is, but I have a real love/hate relationship with that soup! 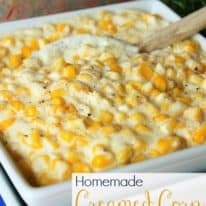 I had the idea to merge it with one of my favorite, easy macaroni and cheese recipes – only I knew I wanted to lighten it up a bit. True mac & cheese needs an amazing cheese sauce based on melted butter and flour to thicken. 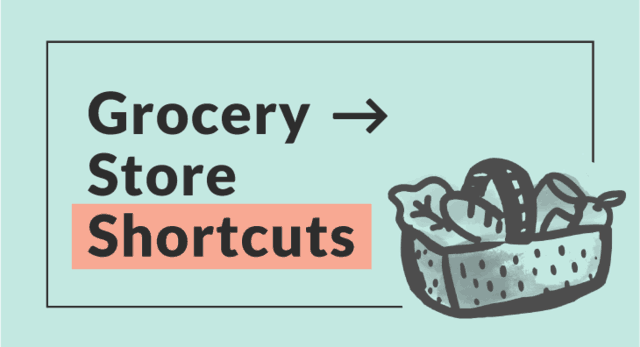 Since the new year, I’ve been really trying to watch what our family eats especially because we (ahem, mainly me) indulged SO much with cookies, cakes, and candy. 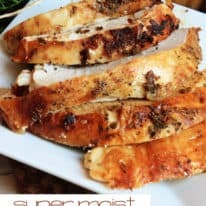 I tried replacing the butter in the cheese sauce with Smart Balance butter, you can replace equal amounts in a recipe that calls for regular butter, and I honestly couldn’t tell the difference in any way! I’ve always been a fan of the Smart Balance non-stick spray, actually that’s the only brand I use. My local grocery store runs really good sales on the brand every few months and I always stock up. 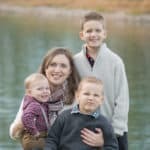 In addition to the butter and the spray, they also make a variety of other heart-healthy products like peanut butter, milk, and mayonnaise to name a few. 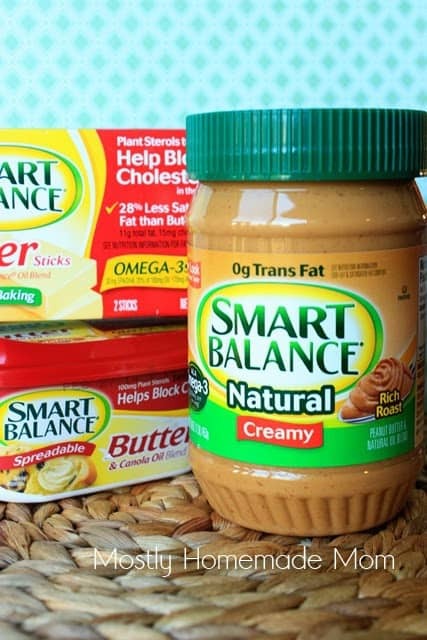 Smart Balance products are made without hydrogenated or partially hydrogenated oil, and have no trans fat. And if they taste exactly the same as their unhealthy counterparts, why not make the switch right? If you’re interested in more recipes using Smart Balance, click here for a free 14 day meal plan. Fill a stockpot with water and bring to a boil. Add the uncooked macaroni and stir in the broccoli florets for the last 6 minutes of cooking. Drain and return back to the pot. In a large skillet, melt butter. Whisk in flour until well combined. While continuing to whisk, stir in the milk and the chicken broth. Allow the sauce to come to a boil, and keep boiling for 2 minutes, whisking during this time while the sauce thickens. Add the minced onion, cheese, mustard, salt, and pepper and stir until cheese is melted. Remove from heat and pour over the macaroni and broccoli. Transfer to a 2 quart baking dish and sprinkle with paprika. Bake at 350 for 20 minutes. Remove from oven and let the dish rest for 10 minutes (sauce will thicken more as it stands). Seriously. One of the best mac & cheese versions I’ve EVER had – you have to try it! Yum! This looks incredible! Im going to pin this to make later for my family. Thanks, Stephanie! I hope you enjoy it, I kept going back and sneaking bites haha. Wow, these all sounds like fabulous meals for a cold day. Yum! I'm hungry for some soup now 🙂 Pinning! And stopping by from Family Fun Friday. 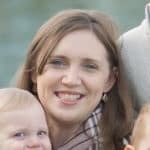 Hi there, I'm stopping by from Two Cup Tuesday at Pint Sized Baker. 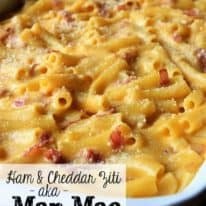 I love mac and cheese of all kinds and just had to check out your recipe when I saw it. 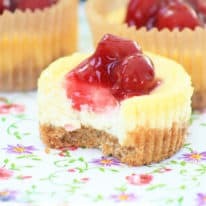 It looks super delicious and I'm intrigued at some of the ingredients that you've used. I'm definitely going to try it out soon and in the mean time, I'm pinning it! 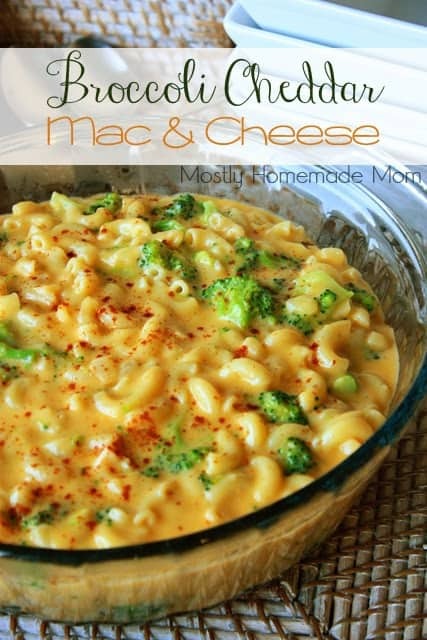 Great combo, Kelly….and it leads to such a creamy mac & cheese! Pinning! I simply need to make it. I will just use veg. broth. I'm so glad that bitter cold spell has passed for now! But it's still definitely cold enough for this chili!! I love vegetable chili and can't wait to try this one! 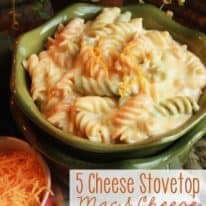 Mac 'n cheese is one of my family's favorite meals! Your version looks fantastic! I love the creaminess of this mac & cheese….it makes all the difference! My family would love this, Kelly! This recipe looks delish, but… Smart Balance is anything but smart. If you want to be healthy, use real ingredients like actual butter and milk. Jackie, you can easily substitute regular butter and milk in this recipe. Hope you enjoy!